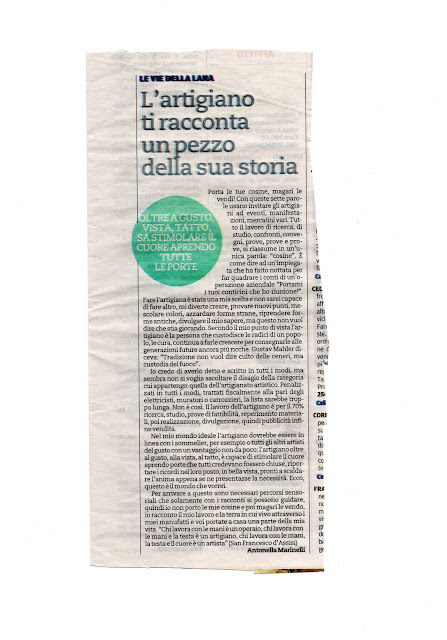 For my English friends,this is my article in the weekly column (Le vie della lana) of the newspaper Il Centro. That's my job, that's what I do. Enjoy reading and sorry about my English. "Bring your little things, maybe you'll sell them!" With these words on use to invite the artisans to events, markets. All the work of research, study, comparisons, conferences, tests, tests and tests, is summed up in one word: "little things". It's like saying to an employee who has made a night to finish a job for an important business operation "Bring me your "little work" 'couse I have a meeting!". Making artisans was my choice and I would not be able to do anything else, I enjoy creating, trying out new points, mixing colors, venturing strange shapes, resuming old forms, divulging my knowledge, but that does not mean that I'm playing. According to my point of view, the craftsman is the person who keeps the roots of a people, takes care of them, continues to make them grow to deliver them to even richer future generations. Gustav Mahler used to say: "Tradition is not the worship of ashes, but the preservation of fire". I believe I have said it and written it in every way, but it seems I do not want to listen to the discomfort of the category to which I belong: that of artistic craftsmanship. Penalized in every way, treated fiscally like electricians, hairdressers etc..., the list would be too long. It's not. 70% of craftsman job is research, study, feasibility tests, finding materials, realization, advertising and finally sale. In my ideal world, the artisan should be in line with the sommeliers, for example, or all the other artists of taste with a really big advantage: the artisan, besides taste, sight, touch, is able to stimulate the heart opening doors that everyone believed were closed, bring back the memories in their place, in open sight, ready to warm the soul in every moment we want. Here, this is the world I would like. To get this on need sensory paths that only with the stories you can drive, so I do not bring my "little things and then maybe I'll sell them", I tell my work and the land where I live through my artifacts and you take home a part of my life.